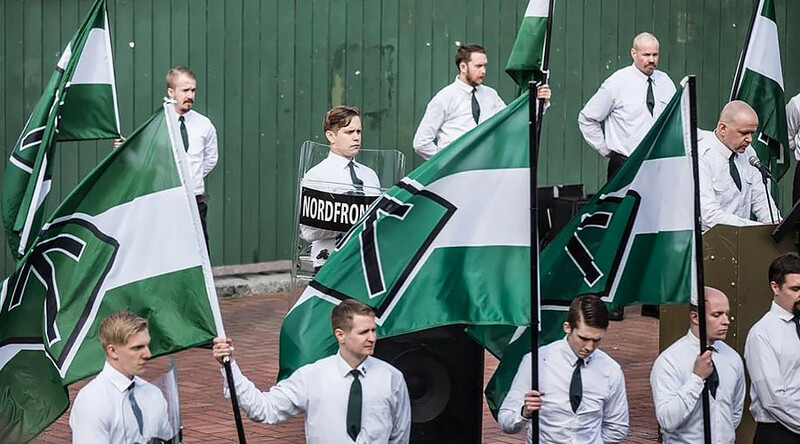 A May Day march by the Swedish based neo-Nazi group, the Nordic Resistance Movement (NRM), was opposed by anti-racist demonstrators in the Swedish city of Falun. Described as a National Socialist organization – which is also active in Finland, Norway and Denmark – the NRM demonstration was one of six marches taking place in the central Swedish city on Monday. Dressed in white shirts, green ties, and black slacks, around 500, almost exclusively male, NRM supporters marched through the city center flanked by police escorts. Along the route of their march, the extremist group was met by counter-demonstrators, many of whom shared their disgust on social media. The NRM participated in last year’s May Day demonstrations in the neighboring city of Borlange, which resulted in the now famous image of one woman’s defiance against the neo-Nazi group. Last year, a report by the Swedish anti-racism group Expo, found that the NRM was mobilising and recruiting new members. The report also highlighted the group's penchant for violence, saying that out of the 159 active members they studied, 26 percent had been charged with violence or weapons offenses in 2015 and that 56 percent had been convicted of a criminal offence at some point in their lives.